Denmark has a problem — it’s generating too much power from the wind. 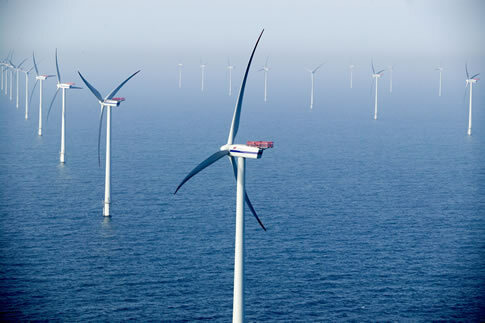 Currently, Denmark gets about 20% of its total electrical power from wind. On windy days, that percentage can double. The ups and downs of wind power can strain an electricity grid. In western Denmark, the price of electricity can drop to zero on a windy day, leaving utilities scrambling to offload excess power or take a financial hit. To solve this problem, the Danish utility company Dong Energy plans to build a nationwide system to charge electric cars with the surplus wind power. They are partnering with a start-up company in California, Project Better Place, and they are planning by 2010 to build the infrastructure to support a countrywide electric-car system, with charging spots and battery-exchange locations across Denmark. In addition to revamping old plants, Denmark has built stronger connections to nearby Germany, Sweden and Norway so it can sell excess electricity on windy days. When it is windy in Denmark, countries like Norway buy cheap power to supplement their own hydropower resources. On very windy days about half of wind power is exported to Norway and Sweden, where many homes are heated with electricity. “We have to keep investing heavily in the grid to make sure we can transport the electricity from wind when and where it is most needed,” said Peter Jorgensen, vice president at Energinet.dk, the nonprofit, state-owned company that runs Denmark’s grid. The Danes. Should have figured. But hey! Here in America, we can just burn more coal. Curt and Jim, I agree with both of you! I like to read a lot about the energy industry and its refreshing to read comments from people that are as optimistic as I am. it is nice to not read a comment about an article that just tells how bad an idea is. And I agree with you. on a different note, I really enjoyed the article. I hope that this is a phenomenal success and the rest of the world sees it unfold. Very interesting problems, which is going to be solved very soon. There are very many ways of how to appropriately store additional energy, but most of them lack in low efficiency rate or high prices. However, these problems are going to be solved soon by mass production and thousands of new human minds (scientists, engineers, technicians) working on these topics. Renewable energy sources are becoming more and more trendy. What a great story. I just Stumbled it. Megan, the cars are not so expensive. Right now, a tiny electric car is being made ready for the Indian market and it costs about $2500. There are also $90,000 electric sports cars in the US that are like Ferrari’s (in-expensive Ferrari’s). There are things completely in between. Plug-in hybrid cars will cost about the same as regular hybrids when they are introduced (now, you have to buy a hybrid car and have it converted to a plug-in for about $20,000, but Toyota will have some of these cars at deals in a year or so). If there were a reason, like there is in Denmark, they could be provided faster and price would go down with quantity (assuming no shortage of batteries, anyway). There just isn’t enough awareness or market in the US yet, but it is growing, with blogs and websites and clubs and legislation devoted to plug-in-hybrids and electric cars. wow, but the catch is- how much are these cars going to cost! ?